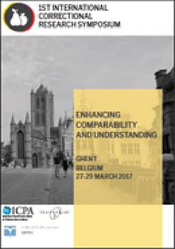 ICPA in collaboration with EuroPris and the Belgian Prison Service is organising on 27-29 March 2017 in Ghent, the 1st International Correctional Research Symposium. The two-day conference aims to improve the ways we conduct research in corrections. Having an accurate and understandable picture of the situation within corrections is crucial for making decisions with regards to how prisoners and ex-offenders are managed and for future planning on a local basis. Information gleaned on a local level is aggregated on a national level to inform heads of service, ministers and policymakers. Furthermore, many academics, NGOs and non-profit organisations conduct research to try to compare this information on an inter-jurisdictional basis. This conference will focus on each stage of harnessing data at local, national and international levels, to look at current research undertaken within correctional services and by external agencies, and through discussion to share our experiences and seek ways to enhance these processes. We hope this will be the first in a series of such gatherings that will seek to enhance the way we conduct research and to open routes for future collaborations, knowledge exchange and learning. begin identifying some potential solutions which can promote the development of shared data definitions and statistical comparisons cross-jurisdictionally. This will be a particular focus of this first Symposium. The research specialists among our various jurisdictions and departments comprise a large and fragmented community. Their task is a difficult one, and with often limited opportunity or scope to share their knowledge and practices with others or indeed to learn from the work going on in other areas. This event has the purpose of inviting researchers with a broad interest in criminal justice and corrections issues, especially as it pertains to the measurement of performance, quality of services and outcomes in the delivery of correctional services, as well as research managers from correctional agencies worldwide, including both prisons and community services. We also invite those working in data analysis technologies to attend and share your experiences with regards to industry recognised methods, tools and approaches for data collection and analysis. Registration fees are set at the special rate of 195 EUR for delegates from Public Sector, Government, NGO/Non-Profit and Academic institutions (375 EUR for all other participants). For more information and to register for this unique event please contact a member of our team at crs2017@icpa.ca. EuroPris is offering 2 participants from each of the EuroPris jurisdictions the chance to register for the Correctional Research Symposium without cost. To see if you are eligible and to receive the code, please contact Julia Ilyina at secretariat@europris.org. Take part in this unique event which aims to bring our shared understanding of global corrections to the next level. Discuss the challenges and successes with other researchers in the field and learn about the latest tools and techniques which will enable you to perform better analysis within your organisation.